Heat oven to 375°F. Unroll dough and separate into 2 long rectangles. Place in ungreased 15x10x1-inch pan or 13x9-inch pan; press over bottom of pan to form crust. Press edges and perforations to seal. In medium bowl, mix cream cheese, sugar and peanut butter until smooth. Add corn syrup, vanilla and egg; blend well. Pour peanut butter mixture over crust. 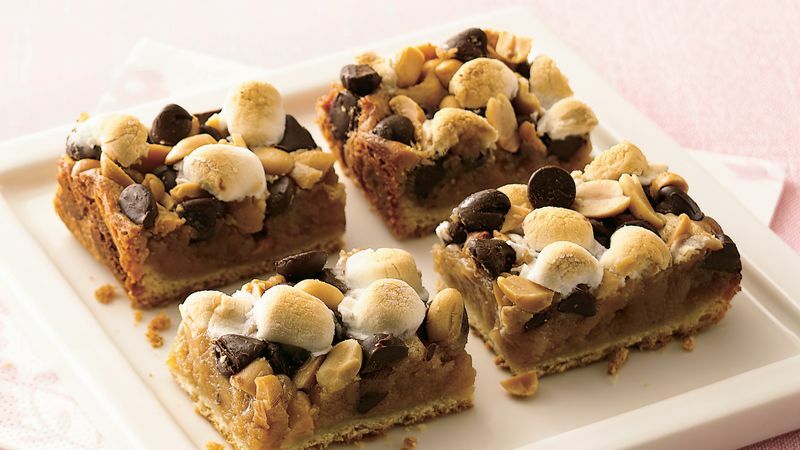 Sprinkle with marshmallows, peanuts and chocolate chips. Bake 15x10x1-inch pan 18 to 22 minutes, 13x9-inch pan 25 to 30 minutes or until filling is puffed and edges are deep golden brown. Cool completely, about 1 hour. For bars, cut into 9 rows by 4 rows.